A new E-fit of a Barnsley robber is to be released by South Yorkshire Police after the force’s original version was mocked online. The original E-fit features a man with dark hair and a ginger beard, which social media users mocked online for appearing unrealistic. Now the force has admitted that the E-fit could be improved and work is underway to create a new version. Officers want to trace a man who used a knife to threaten a shopkeeper during an attempted robbery in Royston. 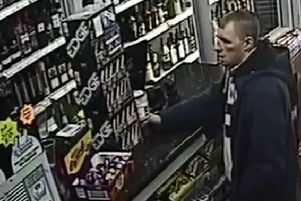 He struck at an off licence on Station Road at 8.40pm on Friday, September 21 but left empty-handed. The crook spoke with a local accent and was around 5ft 4ins tall. South Yorkshire Police said that although the force can ‘see the humour’ in the original E-fit, it was issued in relation to a serious incident and a new one will be created. The force said it can ‘come up with a better interpretation of the offender’s description’.